Buying a new commercial water heater doesn’t have to be a long, drawn-out, frustrating process. You want a high-quality, cost-effective commercial water heater that gets the job done reliably, every time. Front Range HVAC can help. We know commercial water heaters, and we have the trained personnel needed to guide you to the right unit for your unique needs. Because every commercial building is different, there is no one-size-fits-all commercial water heater for all of them. To determine which water heater is best for your commercial building, we will work with you to determine how you use water, how frequently, and in what capacity. This will help us arrive at the ideal commercial water heater for you. Did you know that many brand-new commercial water heaters are overkill for the buildings they’re installed in? It’s true—all too often, we hear stories about 500+ gallon commercial water heaters being installed into buildings that only ever need 100-150 gallons at any given time. This results in the customer spending a lot more on the front end, while also having to pay extra every month in energy costs associated with keeping all of that extra water hot. 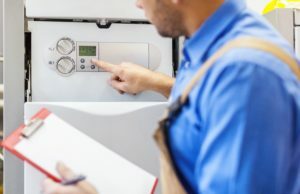 You can avoid costly mistakes by relying on Front Range HVAC to educate you on all of your options when the time comes to purchase a new commercial water heater. At a time and date that works best for you, we’ll perform an on-site evaluation of your commercial property to determine what size, make, and model commercial water heater will work best for you. We consider every factor, especially your budget. At Front Range HVAC, we realize that purchasing a new commercial water heater is a significant capital expense. We know that you as the customer expect to get decades of value out of this investment, and it’s our job to help you maximize your return. In most cases, we can make a recommendation for the best commercial water heater for you within just a day or two, and we can even help with the installation, too! There’s never been a better time to learn how easy it is to purchase a new commercial water heater from Front Range HVAC. Because we have a direct line to the manufacturers of some of the best water heaters available, we’re able to negotiate the best, bottom-dollar deals for the most advanced, highest efficiency commercial water heaters on the market. We’ll even help with the insurance paperwork, if applicable. To get started on a quote, or to learn more about which commercial water heaters may be best for you, contact Front Range HVAC today by calling (303) 942-1372.